“This is my tree. You can’t have it! Cricket wants to dismantle small trees. After Hurricane Sandy, we had piles of branches everywhere on the lawn, and since the trees in our neighborhood are old and tall, the pieces that broke off were often the size of small trees themselves. And that’s what Cricket wanted to master. She wanted branches with tributaries, branches she could trip over as she dragged them by the heel across to her special chewing spot. She wanted to attack the branch that was five feet long and three inches thick. She put her whole body into it, using her paws and her mouth and all of her weight and all of her passionate intensity, her ribcage undulating with the effort. But she could barely drag the monster an inch, with all of that effort, and she couldn’t break herself off a memento to carry back to the porch. She had to settle for the two foot stick covered in grey bark that waited for her by the rim of the sleeping flower garden. It was a blow to her pride, but she got over it. Sometimes she sneaks her sticks into the house. When I have the energy, I throw the sticks for her in the front yard. I throw sticks one after the other to different parts of the lawn until she is out of breath from retrieving, and has given Butterfly a work out jumping over her leash to get out of the way. 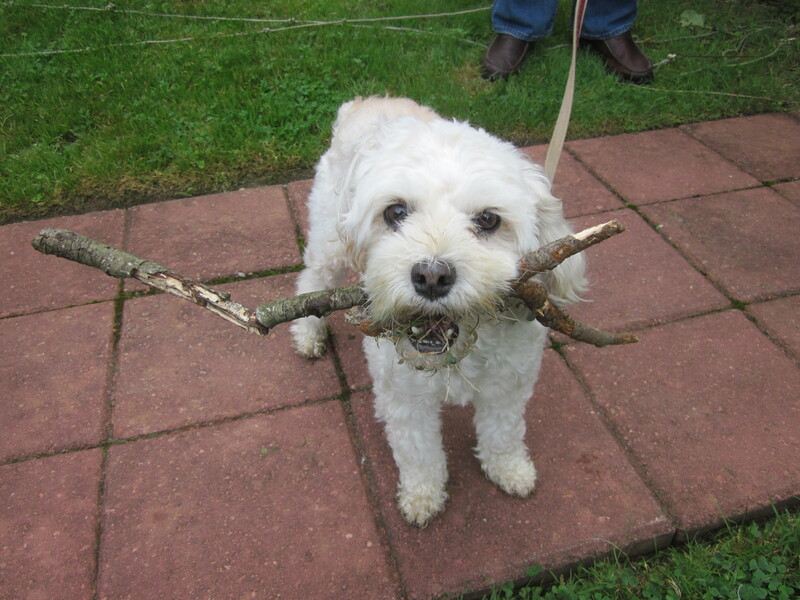 She especially likes to overcrowd her mouth with as many sticks as she can fit without gagging. And even then she gets mad if she can’t pick up just one more stick. She can do five, including one big one, if she’s feeling ambitious. It weighs her down so she can’t run the way she’d like to, but she still won’t give up a stick. It’s her trophy. When she is exhausted, or her mouth is too full of sticks to take on anymore, she picks her favorite stick and goes to her own corner to chew. Cricket holds a stick like a flute, as if she’s about to make music and blow into the mouth piece and play notes with her paws. She can be very delicate with it. She sits eagerly in the front corner of the yard, when she’s supposed to be focused on peeing, and she chews at her stick. She seems to recognize different flavors of stick, like different wines and cheeses. She carefully sniffs for notes of moss and fungus, dirt and flowers, the pee of other animals, and the must of day old rain. This one has notes of fungus, raspberries and lawn-aged pee. For the first month or two, Butterfly had no interest in sticks. She tried to run after Cricket on the lawn, but she didn’t have the stamina, or the interest in chasing flying things. She finds running after squirrels equally inexplicable. She tried chewing on a stick or two, but it didn’t taste right to her and she gave up and came over to me for more scratchies. 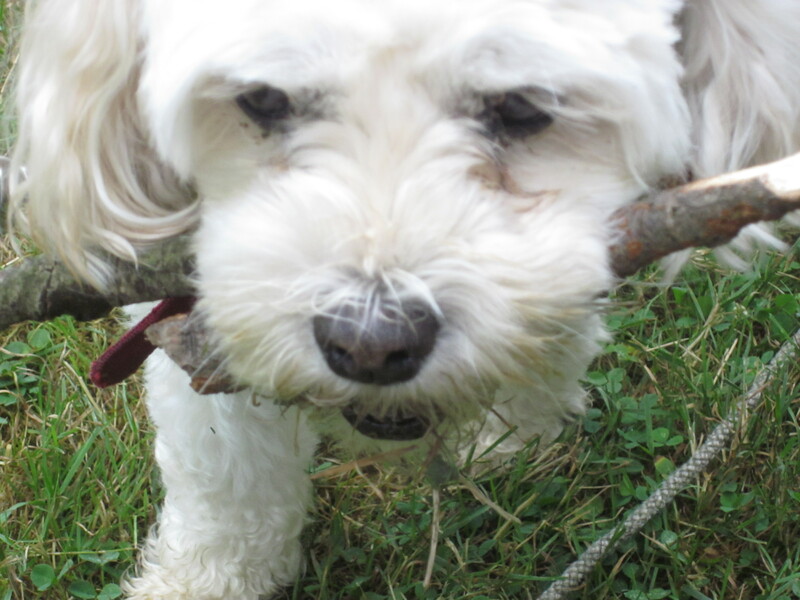 But some time in the past month, she walked over to the corner of the lawn where Cricket usually chews her sticks, and she sat down, and started chewing on a very small stick. It was so tiny that Cricket wouldn’t even look at it twice, but Butterfly thought it was the perfect size. Butterfly in the field of mini sticks. She still doesn’t run after sticks, or leaves, or squirrels, but once she’s attached to her long lead, she’ll wander over to Cricket’s stash in the corner and see if anything looks tempting, and then she’ll start chewing. Or eating, rather. She’s a messy eater, so we now have a covering of bark pieces around the area when she’s done. I wish I could see this as progress, but the fact is that they’re both supposed to be busy peeing, and I have to stand around and wait while they chew contentedly and ignore their bladders. God forbid I try to bring them back into the house before they’ve deigned to pee, they’ll both look at me like I’ve condemned them to the gulag. When I have the energy, I’m better off taking the girls for a walk. Preferably some place where there are no sticks to be found. 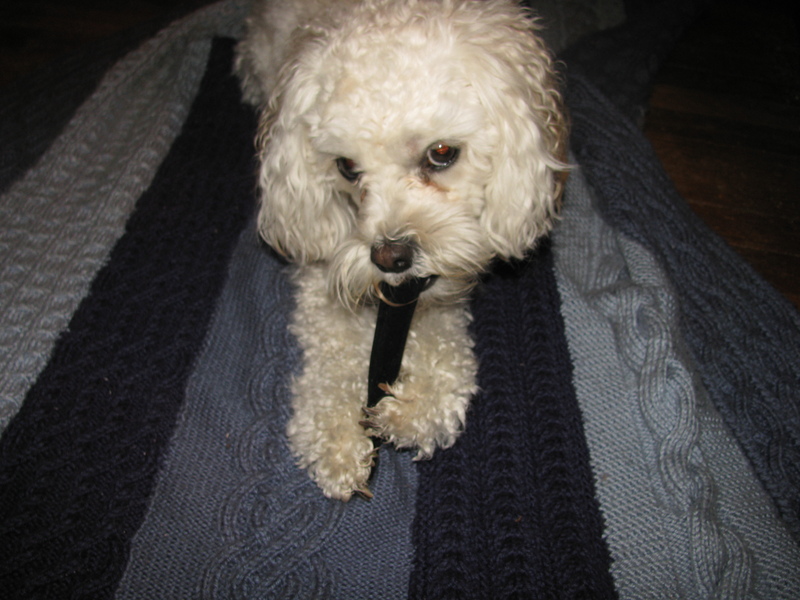 Posted in dogs, memoir and tagged chase, chewing, dogs, humor, memoir, pets, sticks. Bookmark the permalink. Cricket was waiting all winter for a good snow day. She loves to jump and trip and poop in the snow. She loves getting snowballs up and down her legs and watching me freak out and try to melt her in the sink. She loves watching me brush snow off the car while shovels full of snow fly over her head. She loves to eat snow and catch snow with her face. She even loves to slip and slide on the ice, though I do not. 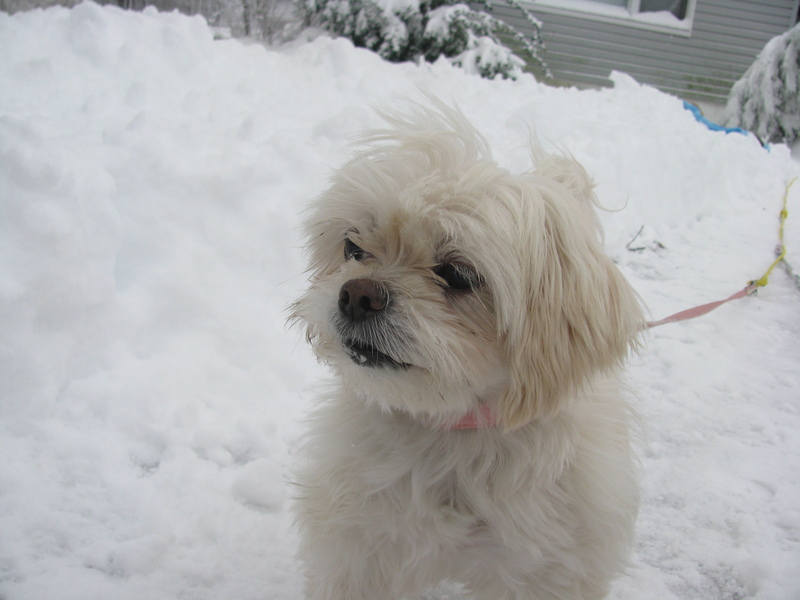 One winter when we had huge piles of snow, she discovered the joy of climbing to the top of a hard packed snow mountain to poop from there. Even when the snow was deep and hard crackle topped, she climbed like a hiker with steel toed boots to deposit her treasure. 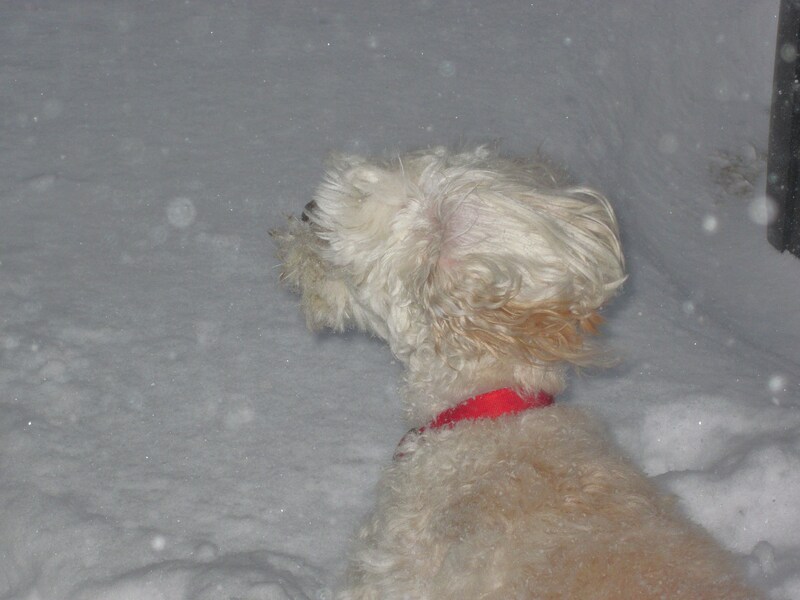 She couldn’t care less that I had to follow her up there and dig through the snow with the poopie bag. Butterfly had only experienced light snows of at most an inch so far, and she barely seemed to notice the change in temperature or texture of the ground. Until the blizzard. The snow started Friday morning and the girls ran out to collect snow flakes on their tongues and in their hair. By late afternoon I was throwing snowballs for Cricket, because her sticks were already invisible under the snow. By the last pee trip of the day, I had to shovel us out of the house and Butterfly was struggling to move through the thickness while Cricket climbed to the top of the snow to deposit one last poop for the day. Cricket and Butterfly in their snow poses. When Butterfly woke me up Saturday morning she’d forgotten all about the weather. She was hopping and thumping her tail and twirling in her usual morning dance to get outside. The front door was tough to open because the snow had gathered on the porch and blocked the door. We pushed our way through and with Butterfly under my right arm and the shovel under my left arm I tried to make a path for us. Cricket ran ahead, but Butterfly and I fell into two feet of snow. I picked myself up, but Butterfly couldn’t move her short legs. She had to be air lifted, or Mommy lifted, out of the snow bank and back behind me while I shoveled us forward. I did fifteen minute shifts of snow shoveling throughout the day, while the dogs ventured out with Grandma and barked at snow blowers and begged treats from neighbors. It took me until three o’clock in the afternoon to shovel the car out of its igloo and I was exhausted, but Cricket was ready for more adventure. 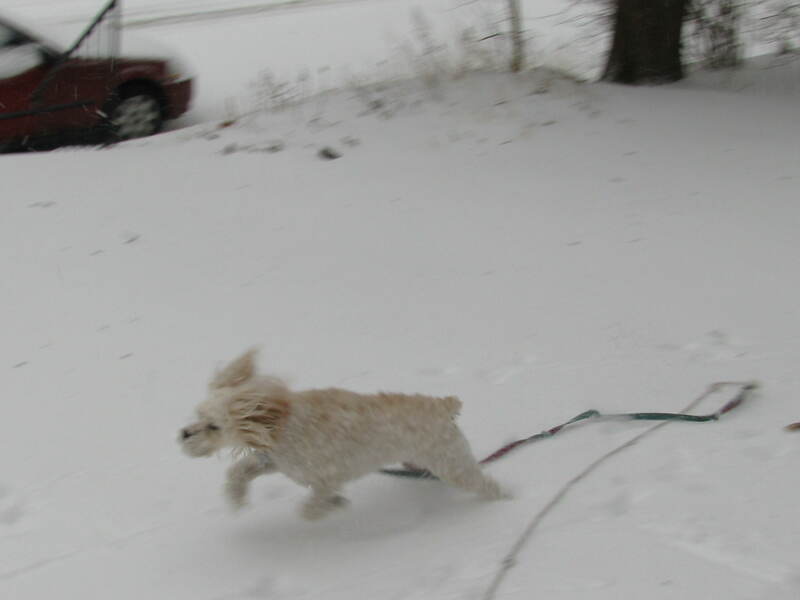 She climbed and jumped and did a face plant into the snow. Butterfly got snow on her nose and compulsively tried to shake it off ten times. We took a long, well deserved nap to recover from our day. 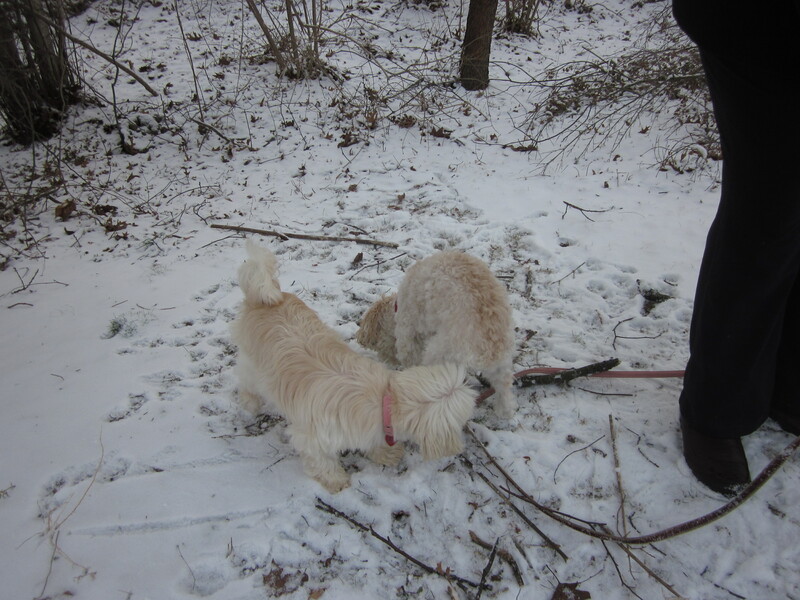 By Sunday morning, the snow had hardened and Cricket had mountains of rock-like snow to climb. She’s an explorer discovering new territory on every expedition. Butterfly watches her sister with awe, but prefers to search for new and exciting pee spots on the solid, flat ground. 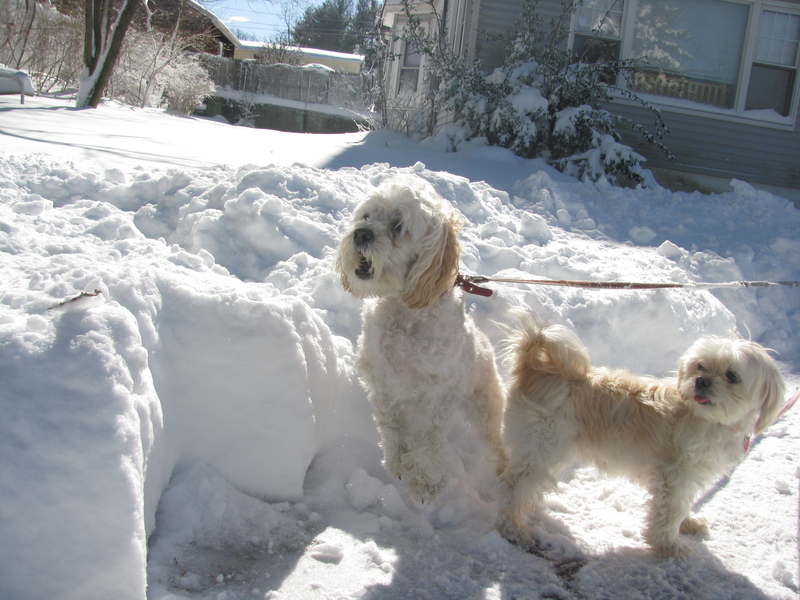 Posted in dogs, memoir and tagged blizzard, dogs, humor, memoir, nap, pets, snow. Bookmark the permalink. I think it all started as lullabies when Cricket first came home in the car. She was two pounds of fluff on my lap in the back seat and I sang to her to help her calm down during the long drive from New Jersey to Long Island. I don’t remember what I sang, probably whatever was stuck in my head from the radio, or some Hebrew songs from school, and a lullaby or two. I was reduced to Twinkle Twinkle Little Star and Row Row Row Your Boat by the end. But it worked. It helped Cricket relax onto my lap. And I tried it again whenever she seemed to get overwhelmed, in the crate, by noises in the house, or when she woke up at three AM to pee, or when she was trying to master the stairs. So it was natural for me to sing to her when she was learning to pee outside. I would clap for her when she peed and I’d repeat the word “pee” so she’d pair the word with the action. And then I’d repeat myself, and add a melody to the whole thing. I never knew why certain songs jumped into my head and became pee and poop songs, though. When I went to sleep-away camp as a kid they used to take popular songs and jingles and change the words. So I automatically started rewriting songs I knew, to fit Cricket’s needs. There was a resurgence of pee and poop songs when Butterfly came home in November and needed encouragement to learn to pee outside instead of in the kitchen. “Baby it’s cold outside,” is a perennial favorite of mine, because it is a duet and I can imagine Cricket singing her part the way she cries and cuddles against me. “I really must pee.” That’s her line. “But baby it’s cold outside.” That’s mine. “I’ve got to go pee!” More insistent this time. “But baby it’s cold outside.” Me, still deluding myself that I have a choice. We have this conversation daily and it’s nice to be able to put it to music, given that Cricket will inevitably win the argument and I will have to go outside and freeze my face off. I don’t even remember the original words anymore because the pee lyrics have become so prominent in my mind. I just see Cricket’s puppy dog eyes filled to the brim with unshed pee and the song pops into my head. I’ve started dancing to the pee songs lately, to encourage Butterfly, especially after ten o’clock at night when the wind is howling and I need her to hurry up so I can go back inside and not worry that she’s going to wake me up at four AM with desperate whimpers. 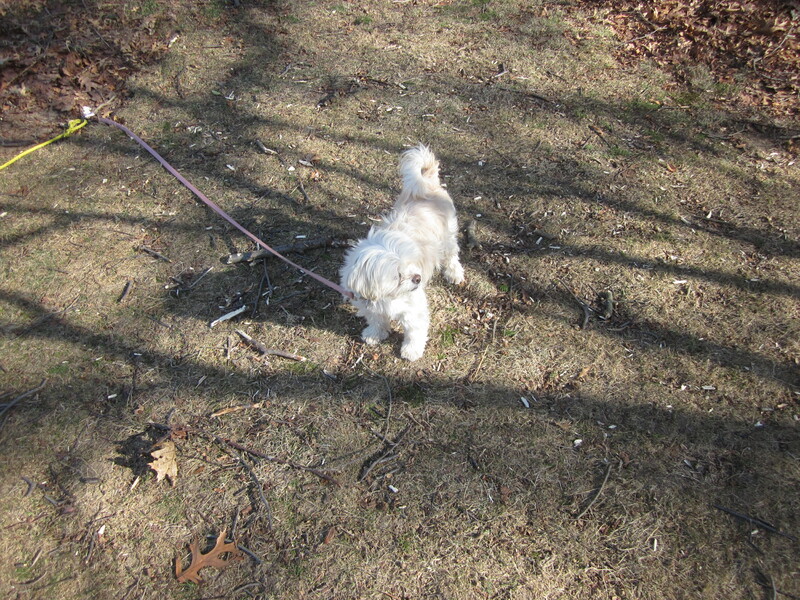 I started out by walking in circles on the lawn, to mimic her pre-pee activities, but she’d get distracted by a noise down the block or by Cricket chewing her stick and she’d forget to pee or stop pooping in the middle. And then I started dancing, partly because it was so freakin’ cold out, but then I noticed that dancing got Butterfly’s attention better than just singing by itself. The fact is, the songs work. At the very least, they make me feel like I can help my dogs live happier, healthier lives. And it’s fun for me. What more could I ask for? 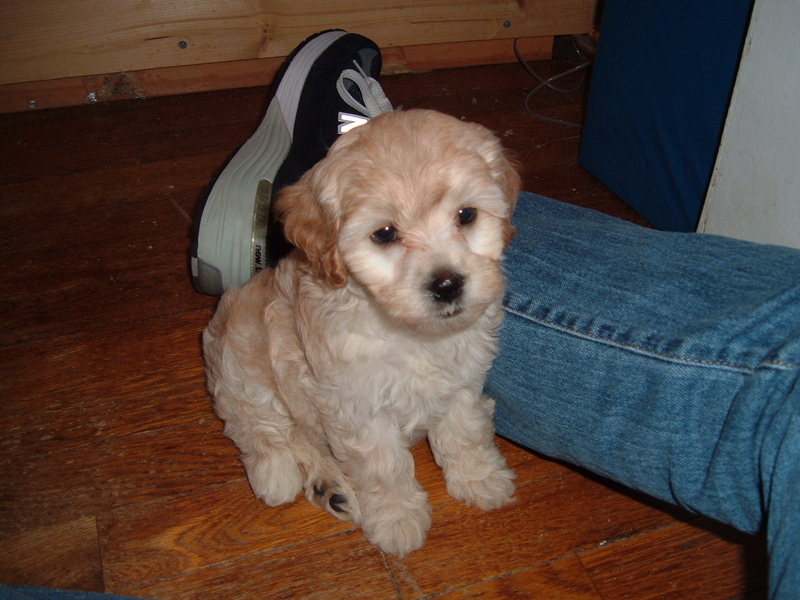 Posted in dogs, memoir and tagged dogs, humor, memoir, pee, pets, poop, songs. Bookmark the permalink. 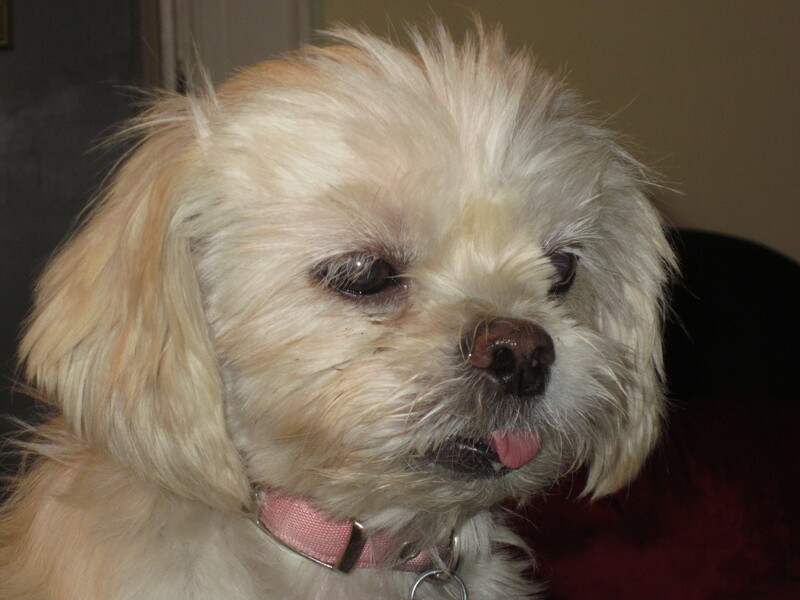 We first met Bella when she was four months old and too small for the pink harness tightened around her chest. She looked like a sling shot, popping out of the harness, leaping from it, trying to fly. Bella is a tan and silver Yorkshire terrier mixed with some unknown, big-headed dog. She lives down the hill from us and we see her leaning out the passenger side window of the car when her family drives up the hill. She gets great joy out of hanging her head out of the window like a daredevil. Cricket likes Bella, up to a point. She likes that they are the same size, and both girls. She likes that Bella seems happy and friendly. It’s only when Bella starts to invade personal space that Cricket rethinks her feelings. Cricket mistakes enthusiasm for aggression and growls, and Bella mistakes the growling for an invitation to play, which gets dangerous and requires lifting Cricket up so she doesn’t attack Bella with her teeth. One day, we came home to find Bella running loose down the hill. It was a shock to drive around the corner and see Bella running down the hill towards us. It was raining, just a little, but enough to make the sky grey and visibility a little muffled. Bella was racing down the middle of the street towards our car and her parents were waving frantically at us. Mom parked the car at the top of the hill, in front of our house, and was about to walk down the hill to help, when Bella’s parents called out and asked if we could bring Cricket in case Bella would run to her and then be easier to catch. They told us that Bella had slipped her collar off and gone racing around the block. 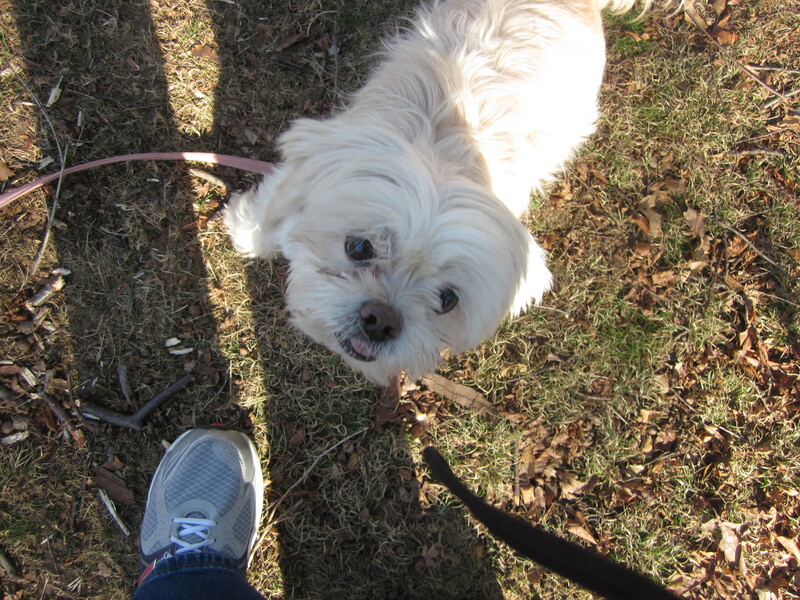 Cricket was thrilled to have her leash put on and she was very excited to see Grandma and Bella’s Mom, and she seemed to know that something important was happening. Bella ran to Cricket right away and came almost close enough for us to grab her collar, but then she sped away again. We created a three pointed trap, with Cricket and Grandma at one corner, then me and Bella’s Mom at the others, all blocking potential escape routes until Bella had no where to go. Bella was soaking wet after running through wet grass for half an hour. And once she was caught, her mom held her, belly and legs out and dangling, ready for the towel her Dad had brought out for her. Cricket was ready to go for a walk of her own after all of that excitement, but I was wiped out. Just walking back up the hill was more than I could handle, once the adrenaline wore out. But I also wanted something more to happen. I’ve felt that way after every dog-saving event. It’s not that I want a reward, though a little statue of me catching the dog would be nice for the top of my bookcase. Cricket and I were at loose ends for a little while, but then we were ready for our afternoon nap. We were pooped. We met up with Bella the other day for the first time since Butterfly has been here. Bella was her rambunctious self and Cricket stood back a bit, but Butterfly went up close and examined her new friend. She stood there without budging, no matter how many times Bella raced from side to side and flattened into play pose. 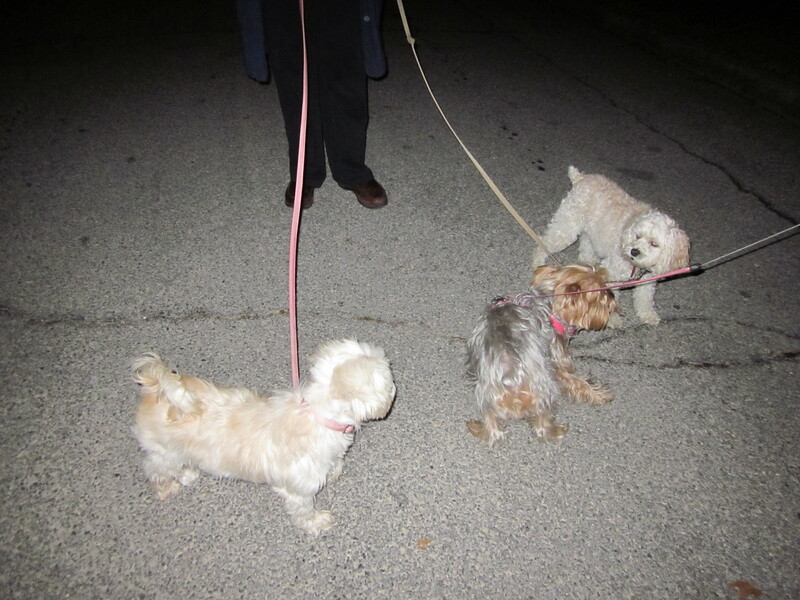 Eventually, Bella calmed down, and Cricket inched forward, and the three of them did some mutual sniffing. Butterfly didn’t seem to mind being the peacemaker between Cricket and Bella. She accepted their different energies and knew how to manage them. She’s very Zen. 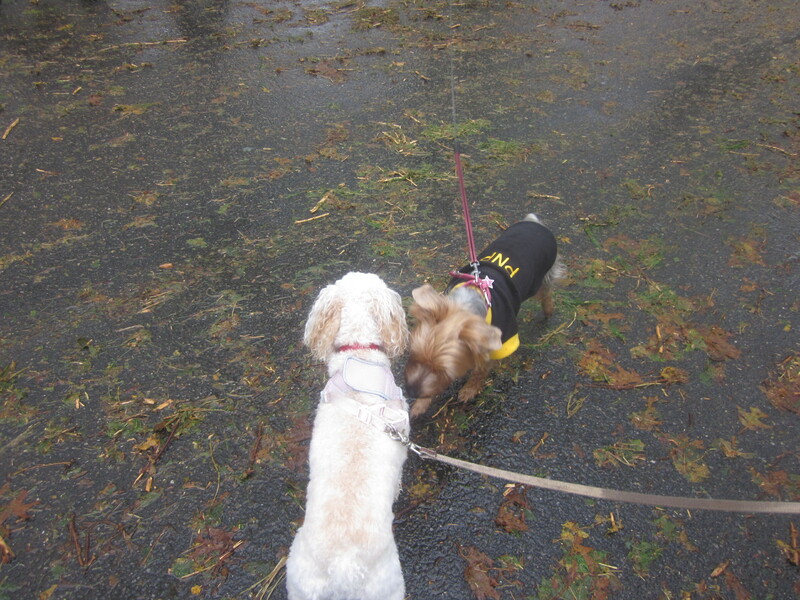 Posted in dogs, memoir and tagged chase, dogs, friendship, humor, memoir, pets, zen. Bookmark the permalink.